This semifinal game will be a rematch for two of the top teams in 8-Man Division I. Hanover snapped defending-champion Osborne’s 21-game winning streak on Oct. 30 in a game that the Wildcats led just 28-26 at halftime. The Wildcats held the Bulldogs scoreless in the second half to go on a win 54-26. The top-ranked Hanover has rolled through their competition, earning quality wins over such opponents as Axtell, Osborne, Madison and Udall. Quarterback Andrew Bruna has been a leader for Hanover and is putting up exceptional numbers in the postseason. In two playoff games, Bruna has rushed for eight touchdowns and passed for six more scores. 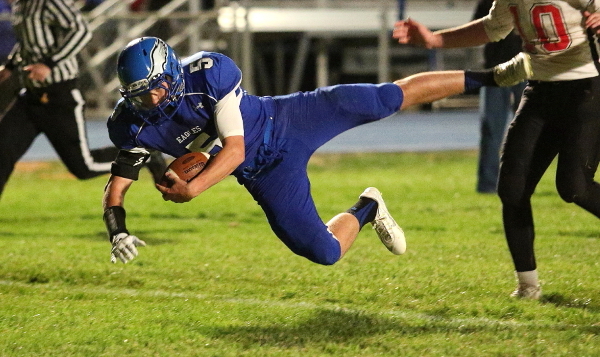 The third-ranked Osborne Bulldogs are coming off a 58-10 win over Marais des Cygnes Valley. Osborne is a balanced squad as it averages about 180 yards rushing and 220 yards passing. Junior quarterback Jake Tiernan has passed for more than 2,000 yards and 32 touchdowns against just seven interceptions. He has been the model of efficiency in his career having thrown for 4,835 yards, 77 touchdowns, and 17 interceptions in his three years starting. In the Week 9 meeting with Hanover, Tiernan passed for 246 yards and a score, but was picked off three times. Sophomore Cullen Grabast has rushed for more than 1,000 yards with 23 touchdowns. Grabast also has about 550 yards receiving. Senior Brandt Walters is one of the top eight-man receivers in the state and has more than 950 yards and 17 touchdowns. Two Central Prairie League powerhouses will match up for the first time in school history. Central Plains collected a 42-40 victory in a classic against Spearville last week. Ness City has won three in a row against quality opponents: Hodgeman County, Oberlin and Little River. Central Plains received another huge contest in all three phases by senior Layne Bieberle (two receiving scores, two interceptions on defense, recovered onside kick at the end of the game) and had great defensive line play late. Bierberle has 1,587 all-purpose yards, including 964 receiving and 23 receiving scores. Junior quarterback Braedan Crities has a 35-to-5 touchdown-to-interception ratio in his second straight all-state caliber season. Michael Lamatsch has quietly put together a great season as the No. 2 wide receiver and made a great catch for the eventual game-winning touchdown against Spearville. The Oilers are known statewide for their offense, but their depth and defense has been a key part of this year’s run. Up front, Michael Ryan (team-high 14 TFLs) and Trustin Kreft anchor the line for the classification’s No. 1 defense with 102 points allowed. Ness City has scored 520 points, No. 6 in the classification (Central Plains is second at 580 points) and has allowed just 220 points. The Eagles, with a 34-player roster, have won six in a row. The Eagles have plenty of depth, including quarterback Tanner McMillan and a backfield that features Pedro Flores, Jacob Hoss and Dylan Hamilton. Hoss had a 79-yard touchdown run early in last week’s 40-28 win versus Little River and finished with 101 rushing yards. McMillan, who has been brilliant this season, collected 131 rushing yards and 148 passing yards with two touchdowns accounted for. Ness City and Central Plains are very close except one aspect – the Oilers have Bieberle. He was the best player on the field against Spearville and will be the difference again Friday.